The Final Tournament Draw has given us the four groups. 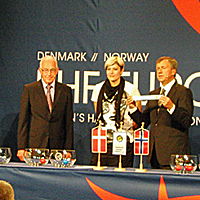 In the half-time of a promotional friendly match between the two hosting nations Denmark and Norway in Arena Fyn of Odense (DEN), the draw for the upcoming Women's European Championship took place. The lucky hands of Romanian left back and World’s Best Rookie of the Year 2009 Cristina Neagu, German Champions League winning line player Anja Althaus, Norwegian legend and reigning European Champion and Olympic gold medallist Linn-Kristin Riegelhuth and Danish national player Trine Troelsen put together four exciting Preliminary Round groups. The tournament takes place between 7-19 dec 2010 in Denmark and Norway.